These Easy Cherry Cream Cheese Danish are simple enough to make for a weekend but special enough to command center stage at your next brunch! I don’t consider myself a baker. Sure, I like to bake, and I can hold my own, but there are soooo many other crazy talented bakers out there that put my efforts to shame. That said, I can knock these Easy Cherry Cream Cheese Danish out of the park! Traditional danish pastries are made with a sweetened yeast dough and filled with any combination of fruit, nuts and/or cheese. Yeast and I do not always jam together (did I mention I’m not a baker? ), so I took a grocery store shortcut with this recipe and used frozen puff pastry dough instead. What is puff pastry dough? In it’s simplest form, puff pastry is a series of paper-thin layers of butter and dough that puffs when it is baked. As the butter melts in the dough, it turns crispy and golden. Yes, you can definitely make your own puff pastry (google how to make puff pastry at home) but there are several reliable frozen options out there that make getting these Easy Cherry Cream Cheese Danish on the table a much faster reality. Tip: Look for all-butter puff pastry if you can find it. Trader Joe’s carries it seasonally and is reasonably priced, so pop a few boxes in the freezer when it’s available. The all-butter flavor is rich and decadent. Is puff pastry hard to work with? Don’t be intimidated by the puff pastry called for in this recipe. It’s much easier to handle than you’d think. Simply defrost the dough overnight in the fridge or for 30 minutes at room temperature until you can unfold it. You want it cold but not hard. And make sure you place the defrosted dough on parchment or a silicone baking mat or it will stick like crazy. Crack the seam a bit? Run your fingers under a bit of water and smooth the break until it comes back together. The dough really is as forgiving as that. The basic recipe for these danish is pretty straightforward. Cut your pastry dough into squares, add fillings to the centers of the pastry squares, shape pastries, brush with egg wash and bake. Danish come in many shapes and sizes. You can easily fold the puff pastry squares into triangles for a turnover-style danish, if you prefer, or simply seal two pastry edges together for an open-faced look. Can I used different fillings in this danish recipe? Absolutely! Not a cherry fan? Use any number of different jam flavors to make it yours. (Pie fillings work great, too.) Whatever flavor you choose, your guests are going to be super impressed by your baking skills. These Easy Cherry Cream Cheese Danish can be easily made in stages if you’re short on time or don’t really want to get up at the crack of dawn to make the magic happen. Make the filling and the icing a couple of days in advance. You can even roll out and cut the puff pastry pieces the night before and keep them tightly covered in the fridge so all you have to do is assemble and bake the next day. A sprinkle of powdered sugar or a simple powdered sugar drizzle on top of the danish is the crowning touch for these brunch beauties! 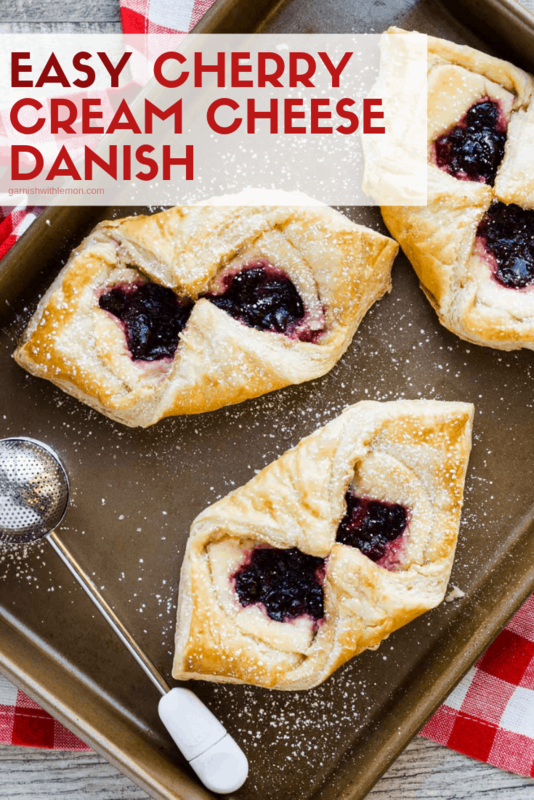 Don’t be intimidated by making your own danish! 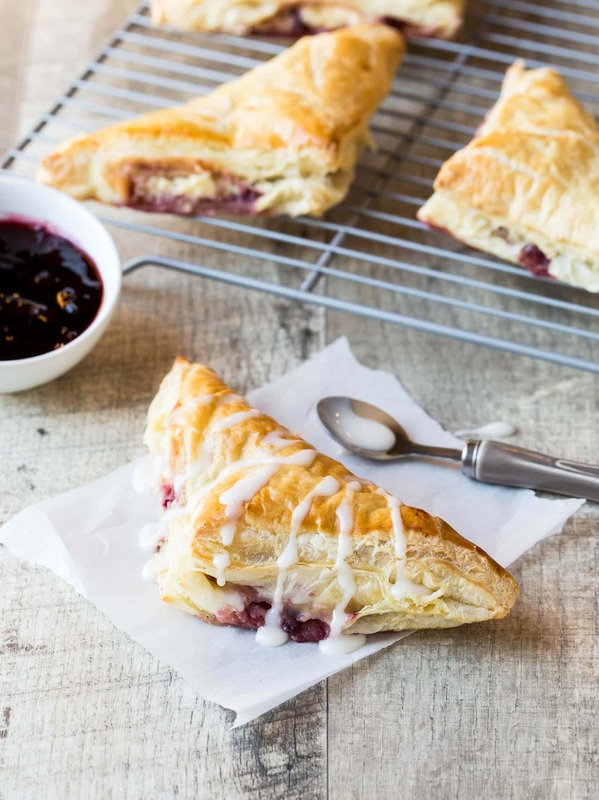 This Easy Cherry Cream Cheese Danish recipe is made with frozen puff pastry dough. Place cream cheese and sugar in a medium bowl. Cream together with an electric mixer on low speed until smooth. Add egg yolks, ricotta cheese, vanilla and salt and gently mix until just combined. Set aside. Whisk together egg and water in a small bowl. Set aside. On a lightly floured surface, roll a sheet of puff pastry out about an inch on all sides so it measures around 10 x 10 inches. Cut pastry sheet into quarters and place pastry squares on parchment- or silpat-lined baking sheet. Spoon a tablespoon of cream cheese mixture into the center of each pastry square, followed by a heaping teaspoon of jam (optional). Gently brush the egg wash around the border of the pastry squares. 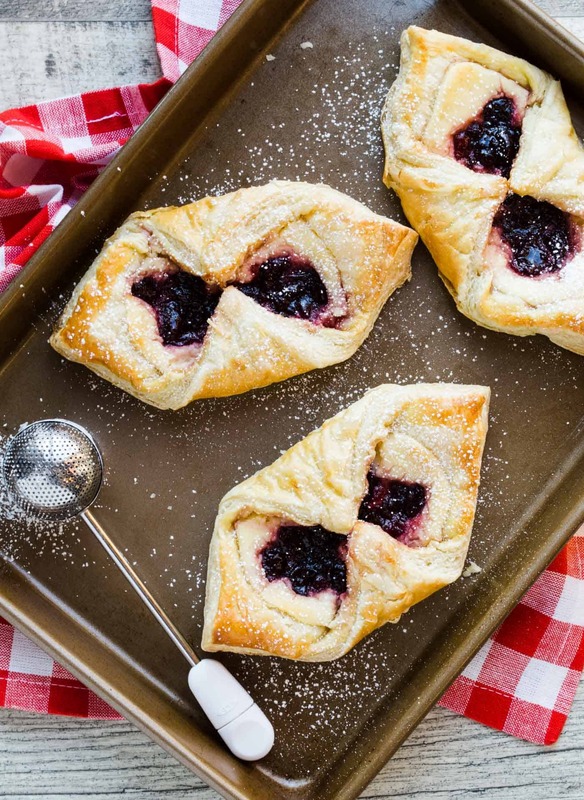 To make a turnover-style Danish, fold each pastry in half completely and seal edges FIRMLY together (or else the filling will ooze out during baking). Brush top of Danish with more egg wash. To make an open-faced Danish, fold two opposite corners of the pastry together and firmly press the corners together on top of the cream cheese/jam mixture. Brush top of Danish with egg wash. Repeat with remaining sheet of puff pastry. Refrigerate unbaked Danish for 15-20 minutes. Preheat oven to 400 degrees. Bake Danish for 18-22 minutes or until flaky and golden brown. Cool slightly and serve warm. Drizzle with icing if desired. 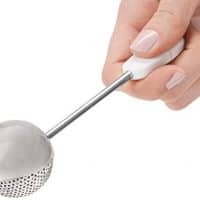 Whisk together butter and powdered sugar in a small bowl and add enough milk to make it smooth. Drizzle on warm danish. You will have cream cheese mixture left over. I froze the extra filling without any problem. These look beautiful, and so good for a special breakfast treat. Can’t wait to try this recipe. We eat toast with almond butter most of the time. It’s a shame, because we can do so much better! Like these easy danish! Love love! Isn’t it crazy how we sometimes get stuck in our food ruts…even as food bloggers! i love danishes.they look great! Anna….i want to make these in the morning,but i don’t have ricotta cheese,but i do have cottage,do you think that would work??? Hmmm, you might. I would drain the cottage cheese if it has a lot of excess liquid. I think your better option would be to omit the ricotta entirely and stick with the rest of the ingredients. Let me know how it turns out! So just a side note, I do not see the jam on the ingredient list. How much do I need? Hi Tiff, the jam is completely optional, but I amended the ingredient list to make that more clear. Enjoy! 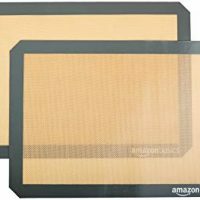 Can these be stored at room temperature or do you need to refrigerate them once they’ve been baked? Hi Gwen, I find they last a bit longer if kept tightly wrapped in the fridge, but you can certainly keep them on the counter if you plan to eat them within a day. Enjoy!